Nu’uanu Pali is on the windward coast of Oahu. Open during daylight hours, you can find this natural pass in the Ko’olau Mountain Range off Pali Highway. There is an entrance fee of $3 per car for non-Hawaii residents. The Nu’uanu Pali Wayside is a lookout point reaching up to 1,200 feet in elevation. From this breezy wayside, you can see breathtaking and panoramic views of Oahu’s vibrant windward coast. This is where King Kamehameha I and his army won the 1795 Battle of Nu’uanu. Here, he defeated the warriors of Oahu and unified the Hawaiian Islands under his rule. On this battle site, 4,000 Oahu warriors fell from Nu’uanu Pali’s towering cliffs to their deaths. While there is no drinking water, the site does have interpretative signs. Ahupua’a O Kahana State Park is on the windward side of Oahu, roughly 26 miles from Honolulu. An ahupua’a is a division of land, stretching from the mountains to the sea. The terrain ranges from Kahana Bay to almost 3,000 feet at its crest at Pu’u Pauao in the Ko’olau mountains. There is frequent rainfall, with temperatures ranging from 60 to 80 degrees. Those interested in Hawaii culture and lifestyle would enjoy this park. 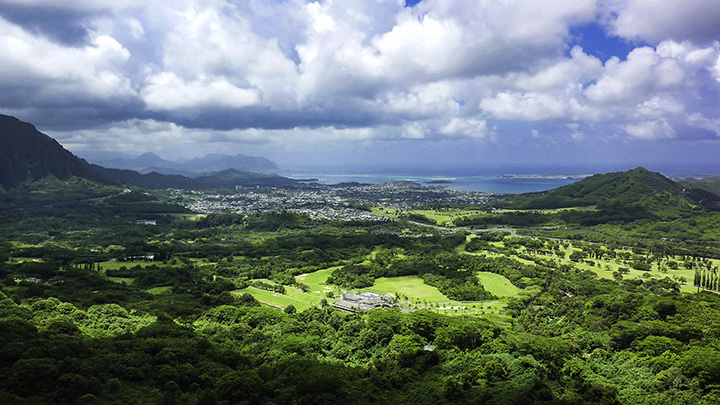 Its primary purpose is to nurture and foster cultural traditions and landscape of windward O’ahu. Ahupua’a O Kahana is a living park, with thirty-one families living in it. The families participate and assist with interpretive programs about Hawaiian values and lifestyle. Hikers can also enjoy two hiking trails. Kapa’ele’ele Trail is one mile long, with views of the bay. While the Nakoa Trail is a 2.5-mile long journey through forests and streams. If you are lucky to be there in season, there may even be local tropical fruit to pick along this trail. Campers can choose from 10 beach campsites with showers, drinking water, picnic tables and restrooms. Camping requires a permit with fees starting at $12 per campsite a night. The park is open to visitors during daylight hours and there are no entrance fees. View from Pu’u ‘Ualaka’a State Wayside Park. This wayside area is in Honolulu off Round Top Drive. The park is open during daylight hours from April to Labor Day 7:00 am to 7:45 pm. From Labor Day to March, the park is open from 7:00 am to 6:45 pm. There is no entrance fee. This wayside area in Honolulu sits on top an extinct volcanic cinder cone. 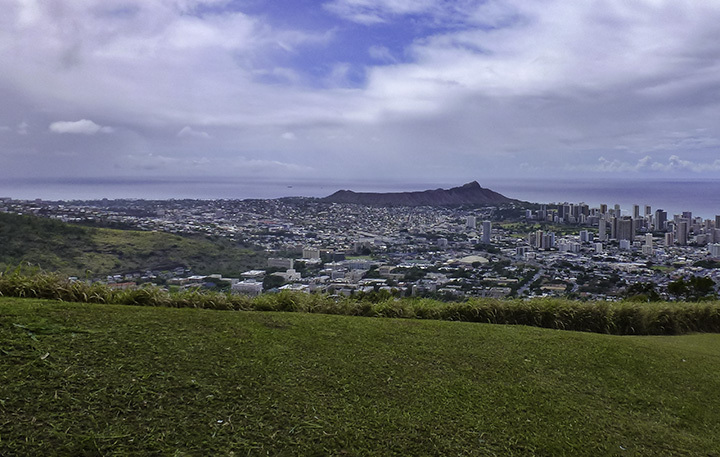 The park offers the best views of Diamond Head, Waikiki and the downtown area. There is also a one-mile trail for those looking for a brisk hike or jog. He’eia State Park is on the windward side of Oahu, near Kealohi Point on the Kamehameha Highway. The park is open from 7:00 am to 6:45 pm from Labor Day to March. It is open from 7:00 am to 7:00 pm from April to Labor Day. The park is mostly ocean front property, consisting of an entertainment hall, water-sports rental stations and seated areas. They offer views of the He’eia Fishpond, Kane’ohe Bay and the Ko’olau mountain range. Various native flora grows in the park, including coconut, breadfruit and monkey pod trees. The word “he’eia” means “washed out to sea.” Here, families can kayak, snorkel or take a boat ride to islands within Kaneohe Bay. Some of the best snorkeling places include: Coconut Island, Turtle Canyon, Horseshoe Reef and Barracuda Alley. Tourists can also rent stand-up paddle boards, go catamaran sailing or learn to how to canoe. Every member of the He’eia State Park staff is a certified lifeguard. They are also able to answer questions visitors might have. This park is geared toward outdoor activities and enjoyment for the whole family. The park has drinking water, payphones, restrooms and outdoor showers. The State Park is on the furthermost tip of the western side of Oahu. It’s accessible from the Waianae and from the North Shore sides of the island on Farrington Highway. It is open daily during sunlight hours and there is no fee for entering the park. Take note that it is not possible to drive around Kaena Point itself to reach the other side of Farrington Highway. 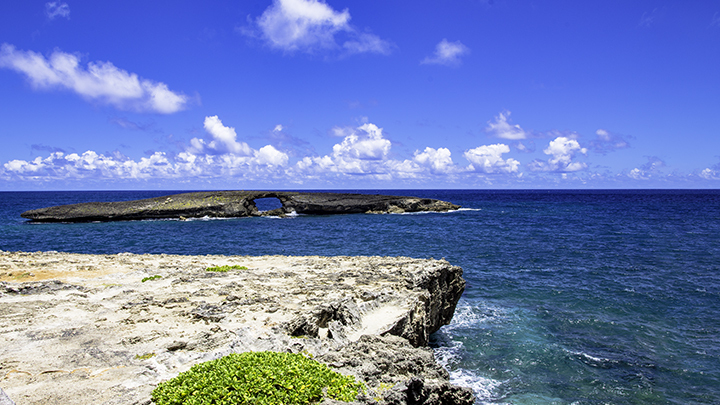 The Ka’ena Point area of the State Park is a remote shoreline area only accessed by foot trails. It is mostly a rocky lava coast with coves and tide pools offering pristine views. The Kaena Point area of the State Park is a natural reserve for a number of rare and endangered plant species. So visitors must be careful not to damage the foliage as they walk through these areas. Visitors can enjoy fishing, hiking or viewing the tide pools for variety of marine life. The area at Ka’ena Point does not have shade and the hikes are notoriously long and dry. So visitors should pack ample amounts of water, in addition to sunscreen, hats and sunglasses. Dolphin sightings are fairly common on this part of Oahu’s coast. So keep your eyes on the water for a glimpse of these graceful marine mammals. Ka’ena State Park is a Natural Area Reserve protecting nesting spaces for Laysan albatrosses, wedge-tailed shearwaters and Hawaiian monk seals. Visitors should be aware that it is illegal to disturb the wildlife here in any way. The rocky coast at Ka’ena Point has some of the largest waves in the State. However, it is not a popular surfing location due to the rip currents and undertows here. It is definitely not safe to swim at or near the Ka’ena Point area of the park. Yokohama Bay and Makua beach, right outside the park area, are the only places in this area safe to swim. But even in these areas, you can only swim on calm water days or when a lifeguard is present. The Kaiwi State Scenic Shoreline is open free to the public from April to Labor Day 7:00 am to 7:45 pm. From Labor Day to March, the park is open from 7:00 am to 6:45 pm. You can find it off Kalaniana’ole Highway, near Makapu’u Head and Makapu’u Beach Park. 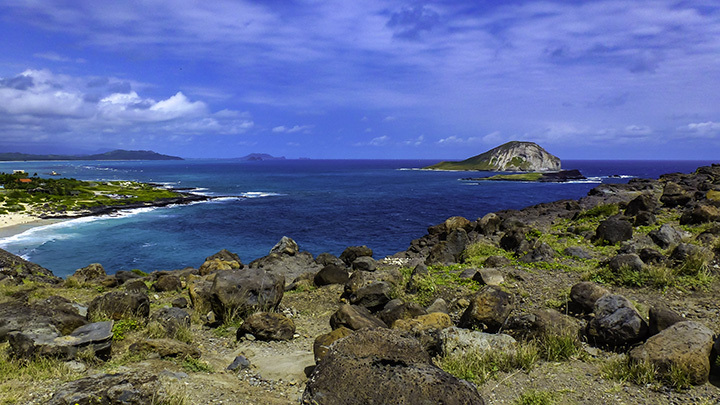 The most outstanding element of this scenic shoreline is the Makapu’u Point Lighthouse. While visitors cannot explore the lighthouse itself, the historic building is visible from the trail. The colors of lighthouse create a striking contrast of red and white against the blue ocean. The trail ascends up 500 feet in elevation and tends to be a hot and windy 2-mile journey. Although there may be less exhausting hikes in Hawaii, this trail provides unparalleled views for whale watching. From November to May, over 10,000 humpback whales pass this area on their way to mating and giving birth. This hike is perfect for those who want a bird’s eye view of some of the largest mammals in the ocean. Note that there is no available drinking water in this area. Because of the dry and hot conditions, travelers must bring plenty of bottled water. Also bear in mind there are no restrooms at the lookout or at head of the trail. You can find Pu’u o Mahuka Heiau State Historic Park on Pupukea Homestead Road, off Kamehameha Highway. There is no entrance fee and the site is open for visiting during daylight hours. Hawaiians built this historic site in the 17th century. The name “pu’u o mahuka” means “escape hill.” This heiau, the largest on Oahu, once played a key role in political power, decision-making and religious practices. The heiau remained an active element of religious worship and sacrifice until the early 19th century. The heiau extends over nearly 2 acres of land and has 3 walled areas stacking several feet high. It offers views of Oahu’s North Shore as well as of Waimea Valley. This heiau is supposedly aligned to another heiau in Wailua, Kauai. Here, signal fires could be sent between the sites for communications between the islands. At this time, the Pu’u o Mahuka heiau is viewable only from the outside. This is to prevent visitors from potentially damaging the site’s interiors. Visitors should bring bottled water as there is no drinking water available. This State Recreational Area is roughly 12 miles west of Waikiki, above Aiea and Pearl Harbor. It is over 380 acres wide and is open from 7:00 am to 7:45 pm from April to Labor Day. It is open from 7:00 am to 6:45 pm from Labor Day to March. There is no fee to enter the park. There are campsite rentals for those wanting to stay overnight. Kea’iwa Heiau State Recreational Area features groves of balmy eucalyptus trees and Norfolk pines, coastal views, trails and campsites. The Kea’iwa Heiau was once a “healing temple.” Here, a priest would diagnose and treat ailments suffered by the people. Remedial herbs and plants that would aid the healing process surround the area. Builders constructed the heiau, with a 4-foot rock wall enclosure reaching 100 by 160 feet, in the 16th century. This sacred place was damaged during World War II. But efforts have been made to restore the heiau. Visitors are asked to remain respectful during their visit by not tampering with or removing anything from this ancient site. Vacationers and guests can also rent camping plots in the park. Hikers can venture out on the 5-mile Aiea Loop Trail. This trail offers views of Halawa Valley, Diamond Head and Honolulu. Along this hike, travelers can also witness the remains of a World War II B-24 bomber. Camp sites are available in four places within the recreational area, each of which cost $5 per campsite per night. There are restrooms, showers, picnic tables, barbeque stands, drinking water and payphones. In central Oahu, you can find sacred birthstones at the intersection of Kamehameha Highway and Whitmore Avenue. There is no entrance fee and the site is accessible during daylight hours. The site near Wahiawa, spreads across a 5-acre area between the Wai’anae and Ko’olau mountains. There are eucalyptus trees, palms, pineapple fields, petroglyphs and monoliths at this site. At this historic location, visitors can step back in time to a site where ancient Hawaiian queens gave birth. The Hawaiians believed if a woman in labor lay against the birth stones, the gods would bless her offspring. The rocks are as old as the 13th century. These grounds were likely the primary royal birth place from 1400 to 1500 AD. This place is one of the most significant sites of Hawaiian history. It not only reflects its culture and religious superstitions, but is a place where life began for kings and chieftains. Two of the most well-known chiefs who were born here were Kakuhihewa and Kuali’i. Many refer to this place as a “Hawaiian Stonehenge” believing that the rocks can help to track movement of stars. 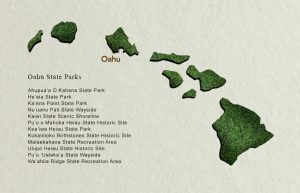 Visitors can explore the grounds or hike nearby trails and see an ancient heiau. For anyone interested in Hawaiian history, this site is a must-see. The Malaekahana State Recreation Area is on the windward coast of Oahu. 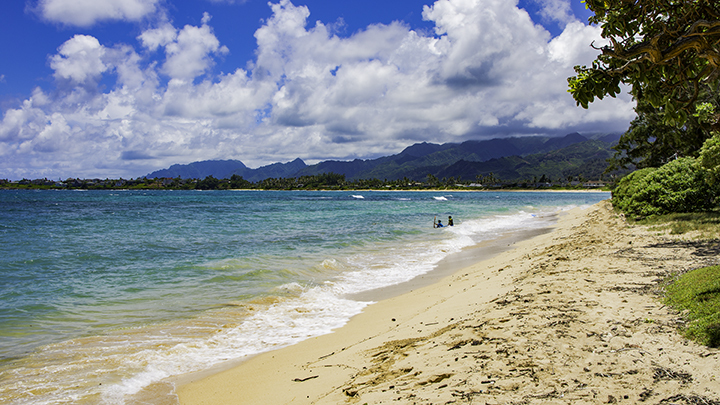 It’s about one mile northwest of the town of Laie, off the Kamehameha Highway. The area is open each day during the day time and is free of charge. There are also camping permits available for those wanting to stay overnight. This recreational area is 37 acres of wooded, coastal areas and beach. There are security services onsite at all hours of the day and night. Visitors can enjoy a picnic in a shady wooded area near the shore. After an afternoon lunch, they can venture into the waves and enjoy swimming, body surfing and boogie boarding. For those who want to extend their fun, there are 40 camp sites and cabins to rent. The nightly price per campsite is $18 for non-residents (6 people or less). For every additional camper exceeding 6 per site, there is an additional nightly fee of $2 to $3 per person. Check-in time begins at 2:00 pm with check-out time no later than noon. The campsites are available from Friday to Wednesday weekly. Please note, beyond purchasing a camping permit, guests must also obtain overnight parking passes as well. The park has showers, restrooms, campsites, picnic tables, drinking water and payphones. This Heiau State Historic Site is near the town of Kailua, adjacent to the Kawainui Regional Park. The site is open during daylight hours and does not require any entrance fee. The park is next to the Kawainui marsh with a tropical garden and nearby taro patches. The heiau features lush open spaces and an expansive rock structure. The Ulupo Heiau State Historic Site is the second largest heiau on Oahu and is an important spiritual place. Ornate garden walkways surrounds Ulupo Heiau. Here, you can see a fishpond, taro patches, banana trees, coconut palms and distant mountains. The site has a 30-foot high rock wall covering 140 by 180 feet of space. Hawaiians likely used the heiau as a worship site or as a place to make offers after success in battle. Its monumental size and the fact that its many foundation rocks came from miles away are impressive. Supposedly, the 15th century chief Kakuhihewa and the 17th century chief Kuali’i led various stages of construction of the heiau. Visitors can wander around the ancient site or enjoy the nearby marshes, garden and fishpond. Travelers should be respectful of the site’s history. There are no restrooms here. The park is near the town of La’ie at the end of Naupaka Street, off Kamehameha Highway. The site is open during daylight hours and is free of charge. This is a rocky point with views of the surrounding coast and nearby Kukuiho’olua Islet. Kukuiho’olua Islet, among other islets in the area, serves as a seabird sanctuary. Here, tsunami waves created a unique and picturesque sea arch in 1946. This park is open free of charge from 7:00 am to either 6:45 0r 7:45 pm, depending on the season. Wa’a’hila Ridge State Recreation Area is near Ruth Place, off Wai’alae Avenue in Honolulu. In this Norfolk Island pine forest, guests can enjoy a shady picnic while overlooking the scenic Palolo and Manoa valleys. There are hiking grounds in the nearby forest reserve for anyone hoping to explore the grounds further. The hike offers great views of Ka’au Crater, a waterfall and spectacular views of Manoa and Palolo valleys. There are picnic tables, hiking trails, drinking water and restrooms available.